For fighter info, see Mewtwo (SSBM), Mewtwo (SSB4), and Mewtwo (SSBU). 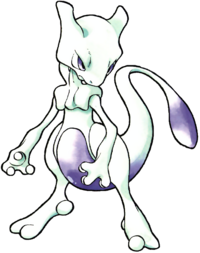 Official artwork of Mewtwo from Pokémon FireRed and LeafGreen Versions. Mewtwo (ミュウツー, Mewtwo) is a fictional creature from the Pokémon series. It debuted in the series' first generation, and represents that generation as a playable character in Super Smash Bros. Melee, Super Smash Bros. 4, and Super Smash Bros. Ultimate. Original artwork of Mewtwo from Pokémon Red and Blue Versions. Mewtwo is Pokémon #150 in the Generation I Pokédex, the final Pokémon in the list when not counting the generally unobtainable Mew which is #151 in the Pokédex. It is a clone of Mew that has been altered by unscrupulous scientists in order to increase its power and make it solely oriented for battling. As a result, it retains Mew's feline features, but instead sports a gray and purple coloration, a large, humanoid physique and even stronger psychic abilities, due to the alterations to its genetic source material. The Pokédex also categorizes Mewtwo as the "Genetic Pokémon". Mewtwo's mentality also vastly differs from Mew's: the last journal entry written by a researcher who oversaw Mewtwo's origin mentions that its viciousness lead to it violently escaping captivity, while Pokédex entries in Generations I and II establish that it thinks only of defeating its opponents and supplements this intention with a propensity for focusing its powers and resting in undiscovered areas. 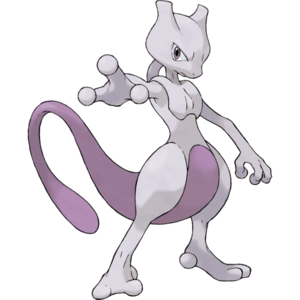 In-game, Mewtwo was designed to be the final Pokémon of the Generation I games and has traits that highlight its status as such: it is a Psychic-type (a typing notorious for being difficult to contend with in Generation I) that sports an immense Special stat, a very high Speed stat, and the highest base stat total with a total of 590 (which increased to 680 once Generation II reformatted stat distributions to the standard used today). As a result, Mewtwo was an overly centralizing force that unbalanced the metagame until the aforementioned reformation to stat distributions split the Special stat into Special Attack and Special Defense, and altered type interactions (which were also brought about in Generation II) collectively brought balance to the metagame. While Mewtwo's prominence waned in the wake of numerous other Legendary Pokémon appearing in subsequent Generations, it nevertheless enjoyed a good degree of fame and popularity among the Pokémon fanbase, thanks to its significance as the original "uber-tier" Legendary Pokémon and for its prominence in the franchise's first movie. After receiving a signature move, Psystrike, in Generation V, Mewtwo's prominence underwent a resurgence in Generation VI thanks to it being among the initial handful of Pokémon to gain access to the new Mega Evolution transformation. Unlike most Pokémon who can Mega Evolve, it has two Mega Evolutions, a trait shared with Charizard. In Mewtwo's case, it will Mega Evolve into the larger and bulkier Mega Mewtwo X while holding Mewtwonite X, which also changes it into a Psychic/Fighting-type. Conversely, it will Mega Evolve into the smaller and lighter Mega Mewtwo Y while holding Mewtwonite Y. In the Pokémon anime and movies, Mewtwo is, at the time of the first movie, a one-of-a-kind Pokémon that develops a hatred for humans, the concept of subservient Pokémon and attempts to prove the superiority of clones over their original counterparts. It later has a change of heart and becomes a sort of antihero, mostly keeping to itself and trying to find a purpose to its existence. Despite the species' purported one-of-a-kind nature, other Mewtwo have appeared across the various Pokémon continuities ever since. Two other Mewtwo have had fully-voiced appearances: one in the sixteenth movie that is capable of undergoing Mega Evolution, and one in the Detective Pikachu spinoff game with a depiction closer to its original incarnation; the latter also directly inspires the computer-generated incarnation of Mewtwo appearing in the Detective Pikachu live-action film. Despite being genderless like Mew, Mewtwo in the anime appear to assume gender roles, much like other Legendary Pokémon that can speak human languages. In this case, the voice for Mewtwo in the initial adaptation is often male (which is reflected in the Super Smash Bros. series), with the exception being the one in the sixteenth movie having a feminine voice. 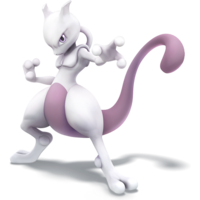 Mewtwo made its Super Smash Bros. series debut as an unlockable character in Melee. It is much more tedious to unlock than most other secret characters in Melee, however; it can be unlocked after either playing 20 cumulative hours of Versus Mode matches (5 hours for four players), or playing 700 Versus Mode matches. Mewtwo is very floaty and includes a decent variety of combos, strong throws, a very good wavedash, above average dodges, a strong projectile in Shadow Ball, and one of the best recoveries in Teleport. On the other hand, it has a bad combination of large size and light weight, which results in it being an easy target to hit and combo while being especially easy to KO, giving Mewtwo some of the worst survivability in Melee despite its recovery and defensive prowess. In addition to this crippling problem, it has general awkwardness in its moveset and movement, with most of its moves being not very useful or outright near useless attacks. To compound this, it lacks solid KOing options, and has slow movement speed. As a result, Mewtwo has infamously sat in the bottom-tier of Melee's tier list for most of the game's lifespan, being among the game's most unpopular characters and considered the worst character at several points in the game's lifespan. However, the efforts of Taj have resulted in Mewtwo being reassessed as a low-tier character, which is reflected with its ranking of 21st and its placement in the F tier. Mewtwo did not return in Brawl as a playable character, despite not being a clone like the other cut characters. This resulted in a significant amount of fan outcry in spite of Mewtwo's lack of popularity among the competitive community, as the majority of players saw it as an unjustified cut. The Mewtwo trophy from Brawl. While Mewtwo does not appear as a playable character in Brawl, there are several empty files on the game disc bearing its name. These include a graphic effects file (ef_mewtwo.pac), a victory theme (snd_bgm_Z38_MYU2), and a Wii Remote selection sound (which no other cut character has). While it is possible that the files are leftover data imported from Melee for referential purposes, the prevailing theory is that Mewtwo was planned to be playable, but ended up being cut. As Mewtwo has the most unused content of any scrapped character, it can be assumed that Mewtwo was the last cut made to Brawl's roster. Mewtwo as it appears in Super Smash Bros. 4. 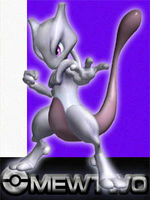 During development of the game, an appearance of Mewtwo's Mega Evolution was reportedly considered by Masahiro Sakurai. During the Pokémon X and Y Developer Roundtable at E3 2013, an audience member asked if developers wanted to see Mega Mewtwo in the next Super Smash Bros. game. While the developers stated that they had nothing to report about the question, Sakurai, who was in the audience at the time, reportedly said "We are thinking about it." Despite this, Mewtwo did not initially make the final cut of the game as a playable character, returning only as a collectible trophy. Mega Mewtwo X and Mega Mewtwo Y also appear together as a singular trophy in Super Smash Bros. for Wii U.
Mewtwo was later announced in the Super Smash Bros. for Wii U: 50-Fact Extravaganza to be a playable character, while its return to the series was notable for being the first time in Super Smash Bros. history that a character has been made available as downloadable content. Consumers who registered both Super Smash Bros. for Nintendo 3DS and Super Smash Bros. for Wii U on Club Nintendo before March 31, 2015 could download it for free as of April 15th, while others were able to purchase it beginning on April 28th. Its moveset is mostly unchanged from Melee, aside from the addition of a Final Smash. Mewtwo is ranked 10th out of 55 on the SSB4 tier list, placing it in the A tier. Upon its return to the series, Mewtwo had been poorly regarded by the competitive scene, as its already light weight was lowered further and its already tall hurtbox was slightly increased in height. However, Mewtwo did see improvements to Confusion and Disable, two of its most arguably least used moves: the former now functions as a traditional reflector, while the latter's stun effect has a longer duration. Despite the aforementioned poor competitive view, Mewtwo saw a turning point thanks to game updates. Update 1.1.3 increased Mewtwo's grounded and aerial speeds, as well as improved its already potent forward smash and aerial attacks. Although update 1.1.5 provided very few changes, they were effective regardless: Mewtwo's weight was marginally increased, its already fast dashing speed was increased to the point of becoming the seventh fastest in the game, and both its up smash and neutral aerial were made safer thanks to adjustments to their ending lag and hitbox sizes, respectively. As a result of these very substantial buffs, opinions on Mewtwo have been much more positive: it has been reassessed as a top-tier character, has managed to earn some noteworthy representation, and it consistently achieves high placings at all levels of play. Mewtwo puts its psychic powers to great use in this game. Not only does it have floaty jumps, but its telekinesis gives its attacks extra reach and its throws added power. However, its light body makes it easy to launch, so if you're willing to risk getting in close, it might just be worth it! Mewtwo puts its psychic powers to great use in this game. Not only can it float in midair, but its telekinesis gives its attacks extra reach and its throws added power. However, its light body makes it easy to launch, so if you're willing to take the risk of getting in close, it might just be worth it! Mewtwo's Confusion side special not only repels projectiles—it also reflects the damage back on your opponent. Its down special, Disable, stuns an enemy for longer the higher its damage is. Disable only works on foes that are facing Mewtwo. Mewtwo's Confusion Side Special not only lets you repel projectiles, it also reflects the damage back on your opponent. Its Down Special, Disable, stuns an enemy for longer the higher its damage is. As it works by having Mewtwo glare at its foe, this only works if they make eye contact. It's almost no surprise that a Pokémon as powerful as Mewtwo wouldn't be limited to a single Mega Evolution. Mega Mewtwo X has strong arms and legs, while Mega Mewtwo Y has a whiplike, slender head. The differences aren't just physical - X brings improved fighting power, while Y can unleash even more psychic power. Mega Mewtwo comes in two forms rather than just one. Mega Mewtwo X has visibly strengthened limbs, which greatly boost its physical abilities in battle. Mega Mewtwo Y, on the other hand, has a whip-like tendril extending from the back of its head, which augments its psychic powers. Mewtwo's appearance in Super Smash Bros. Ultimate. Mewtwo returns as an unlockable playable character in Super Smash Bros. Ultimate. Much like in Melee, it is designed to be unlocked later in the game, as all three of its unlock methods (Smash battles, Fox's Classic Mode unlock tree, and World of Light) designate it as one of the last characters encountered. It is voiced by Masachika Ichimura in Super Smash Bros. Melee, the Japanese voice actor for the first Mewtwo, which is emulated by Keiji Fujiwara in SSB4. Its quotes in the Japanese versions of both games have it boast about its power and question its existence, much like the first Mewtwo did on several occasions. It can use Shadow Ball like the first Mewtwo. Its presence in Mewtwo's moveset is notable, as it appeared in the first movie before it even appeared in the mainline Pokémon series. It can undergo Mega Evolution into Mega Mewtwo Y like the second Mewtwo. This creates a coincidental resemblance to the Mewtwo of the Pokémon Adventures manga, which is likewise depicted similarly to the original series' Mewtwo but can Mega Evolve into both Mega Mewtwo X and Mega Mewtwo Y. It can use its signature move, Psystrike, like the second Mewtwo. However, Psystrike has a unique design and functions differently in SSB4 compared to how it looks and functions in the games and the anime, and Psystrike's animation in Pokémon Sun and Moon was updated to more closely resemble its SSB4 version. Its character introduction tagline in SSB4, "Mewtwo Strikes Back! ", references The First Movie's full English title. Its Boxing Ring character title, "A Legend Reawakens", references Genesect and the Legend Awakened's English title. Mewtwo is the only playable Legendary Pokémon in the Super Smash Bros. series. As such, it is also the only playable Pokémon without evolutionary relatives. Despite this, it does have a form of kinship with another Pokémon. In Mewtwo's case, it is one half of a Legendary Duo, alongside Mew. 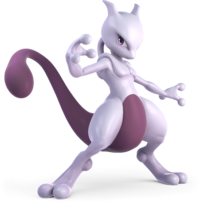 Mewtwo's status as a lightweight in the Super Smash Bros. series contradicts its weight in the Pokédex, where it is listed as weighing 269 pounds. This is seemingly due to its telekinetically-induced anti-gravity. Mewtwo and Lucario are the only two playable Pokémon characters whose onscreen appearance does not involve them emerging from a Pokeball. Mewtwo is the only playable Pokémon in the Super Smash Bros. series not to be voiced by its international voice actors in non-Japanese versions. Pikachu, Pichu and Charizard retain their Japanese voice actors in almost all international media. Jean-Marc Delhausse, the French voice actor for the announcer (in Super Smash Bros. only), Lucario, and some Poké Ball Pokémon, voices Mewtwo in the French dub of the Pokémon anime. However, he does not voice Mewtwo in the French versions of Super Smash Bros. Melee and SSB4, as the respective Japanese voice actors' grunts are present in all Western language versions. Masachika Ichimura and Keiji Fujiwara, both of Mewtwo's voice actors in the Smash Bros. series, had major roles in the Compilation of Final Fantasy VII as Red XIII and Reno, respectively, with its main character Cloud Strife appearing as a playable fighter in the Smash games. Like Lucario, Mewtwo has a special move that is super effective against its own typing. In Mewtwo's case, this special move is Shadow Ball. Mewtwo is the only playable Pokémon in SSB4 to not readily appear in any capacity in Pokémon Sun and Moon. Instead, it must be transferred over via Pokémon Bank. Charizard and Greninja, while unobtainable under normal gameplay conditions, appear as a Ride Pokémon and a member of Red's team, and as a gift Pokémon from Pokémon Sun and Pokémon Moon Special Demo Version, respectively. However, it appears in-game in the direct sequels, Pokémon Ultra Sun and Ultra Moon, and is obtainable in an Ultra Wormhole along with many other legendary Pokémon. In all its appearances, Mewtwo never holds items in its hands, instead using telekinesis to make them float in front of it. When picking up a Hammer, it simply whirls it around with the head pointed forward. The only exception is when Mewtwo uses the Parasol to glide down. Mewtwo is the only Pokémon not to share a reveal trailer with another character. Mewtwo is the only genderless playable character. While all Pokémon in Smash are generally referred to with gender-neutral pronouns, all other playable Pokémon can be male or female (some playable Pokémon even have gender-specific alternate costumes in Ultimate). This page was last edited on April 9, 2019, at 10:50.